Today it’s impossible to imagine live without computers, they have literally changed our lives. People spend most of their time siting and working on their computers, so it’s essential to have lovely environment on your desktop. Unfortunately we only change wallpaper, install new plugins or choose different theme, but what about mouse pointers. In fact only mouse cursors remain unchanged on your desktop, because our eyes follow the pointer movement all the time. As we all know mouse is appointing device, which enables us to fully interact with computer, so after you choose right gaming mice for your needs, then you have to customize it. Even now while you are reading this article, mouse pointers help you to navigate through browser, so good looking mouse cursor is vital. In this article I want to show you cool cursors that will make your life easier and interesting. Plenty of which are free cursors, so everyone can install and enjoy their day. So if you feel bored with your pc you can choose and download your favorite mouse pointer in just a minute. Personally I have tested each set of cursors and I hope you will Love this Guide. The Gant Cursor Pack is based on popular Gant 2 icon set, which combines over 600 icons. The original Gant icons were reworked to design 2 colour scheme pointers for windows, Mac and Linux operating systems. There are 4 sets of pointers in separate folders and they come in two colours: yellow and blue. Also cursors are sized at 24 x 24 pixels, which is ideal for people who like large icons. I think my favourite is blue scheme, because developers managed to create unique and stylish design without copying original artwork. 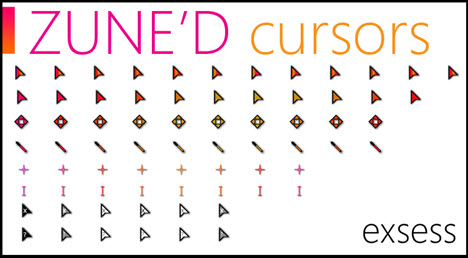 If you are looking for unusual set of mouse cursors, then you definitely have to try Direction theme. This incredible set, offers famous windows FX cursors which is fully animated and loved by everyone. One thing that needs to be reworked is black accents at the borders, so white background won’t cause any problems. Otherwise these are fantastic cursors and you definitely have to try this too. Metro X is first cursor set that I installed on my computer, as I am big fan of windows metro theme. It comes with 15 different mouse pointers, including some of reworked cursors from Entis, which is inspired by windows 8.1. Cool thing about this set is that, Metro X is completely free and it works for all operating systems. Currently I am using it and only thing that I would love to change is cursor lighting, otherwise these are most beautiful cursor set I have ever seen. The actual size of pointers is ideal (32 x32 pixels), and the thanks to included INF file installation process is really easy. Love it. Everyone likes animated mouse cursors of animals, and so far there was no custom animated pointer of yellow duck. Thanks to Flameia Design we got Ducklife, which is set of hand cursors based on duck life 5 game. Another awesome set of pointers for people who love video games and especially 90’s when one of the most respected franchises was created in gaming industry. New Mac OS X cursors, is ideal for windows users who want to completely change, look of their desktop. This set comes with full package of new pointers, so you can make various combinations to imitate the MAC operating system. In order to install this set you have to open INF file and individually choose cursors. Thanks to mercury21, New Mac OS X Cursor is fully compatible with windows 10, meaning that everyone can experience OS X custom cursors on their windows machines. If you are obsessed with Minecrft and spend all days just playing it, then Minecraft Diamond edition cursors is right for you. This set of mouse pointer combine different images including: Minecraft diamond sword, axe, spade and even Ender Dragon. Beside the Diamond Edition there are Tools Cursors, Minecraft Full Cursors and even Minecraft Faces Cursors. This set really make my day randomly testing, and enjoying the funny atmosphere on my desktop. Finally I found something that brings smile to my face. For those people who re fans of Hello Kitty, this set of cursors is featuring cute Japanese fictional character created by Yuko Shimizu. This set is especially popular among teenagers, because girls always like cute little kitties. Hello cursor comes with full set of mouse pointers and also it’s compatible with any OS systems. In order to change the appearance of your mouse cursor, you have to follow the installation process provided on deviantart. People have individual taste someone likes huge icons, but there are people who love small UNDERsized cursors. It’s simple and small size is especially good for editing text or browsing the web. Moreover there are three animated icons, so you won’t feel bored while using this incredible set of tiny cursors. I have got not much to say, just download and Try it yourself. 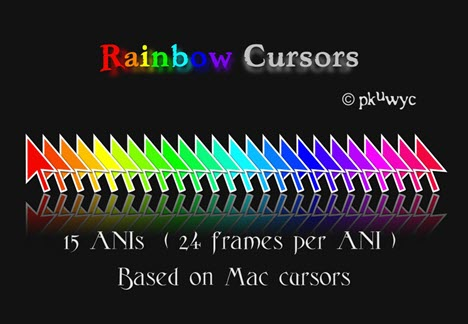 If you are searching for colourful and nice looking set of cursors, then Krystall is right for you. At first sight this application comes with variety of symbols and rounded forms, which look like a windows 7 start icon. Even the colours are the same: blue, green , yellow and red only difference is the order. Unfortunately this version does not include INF file, but in case if you follow the installation process you will be able to use it on any device. If you are searching of colourful and constantly changing mouse pointers, then you definitely have to try Rainbow Cursors. Its design is based on Mac cursors scheme, which includes 15 animated pointers each of which are in 24 different colours. I really love those cursors they are amazing and perfectly look on my desktop. Moreover it’s easy to install, simply open the INF file and choose Rainbow Mac pointer in the control panel, simple as that. Zune’D is an animated cursor set inspired by Microsoft Zune Device. This scheme is especially interesting with its amazing colours and various shapes. New version of Zune’D has improved graphics and smooth animation, due to reduced frames per Second. Included INF file makes installation process much easier, especially on Mac operating system. 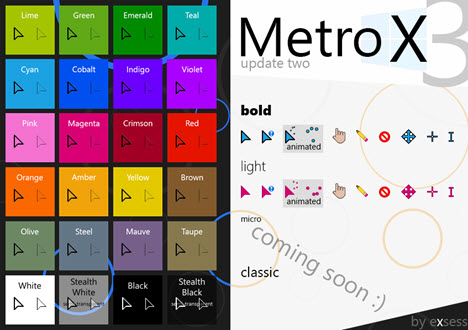 As you older know from this article, Metro X cursor Set offers wide variety of custom cursors, but third version of this incredible theme gives you option to fully control the colour gradient. As a previous version, Metro X3 also comes with minimal animated cursors, but know all the pointers have improved graphics and they look crisp and clear. All the cursors are medium size, and there is no issue while clicking or changing the illumination settings. Installation process is pretty straightforward you can install more than one pointer set at time, which makes installation process really simple. Oxygen Cursors was originally created for KDE 4, but now it is available for linux and mac users. This stylish bundle includes 37 different colour schemes and fully animated styles. 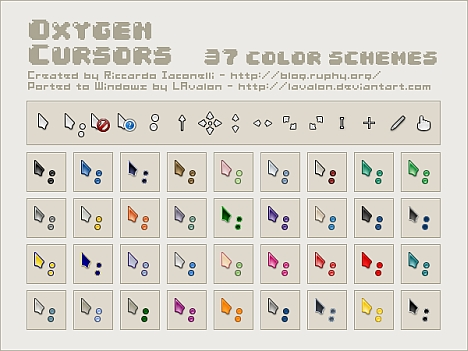 Oxygen Cursors is one of the most popular windows cursors on DevianART, which was initially created by Riccardo Ioconzlli. Love those cursors and recommend to everyone who needs stylish and nice looking mouse. Naruto is a Japanese anime series main character, which is one of the biggest manga phenomenons, with its super power. This cursor set includes static and animated pointers which look fancy on any desktop. 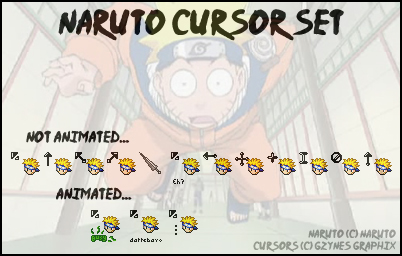 Each cursor features Naruto face that looks as funny as real character in the movie. Installation process is simple despite the fact that INF file is not included, but there is a How-To guide to install Naruto Cursor Set. So don’t forget to install this set and share your thoughts. By far this is the most creative set of mouse pointers I have ever seen in my entire life, because every time I launch my computer smiling faces make me smile too. Vigyori is a set of emoticons, designed by “eFOX-hun”, that means a smiling Hungarian. Just download it and start your day with joy and happiness. 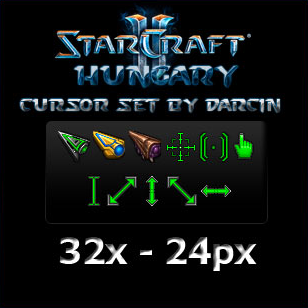 This set of mouse cursors was initially created for Startcarft gamers, for people who are obsessed with this incredible game. StarCraft 2 features different pointers and colours for each cursor, perfect combination for your gaming setup. The only disadvantage is lack of installation wizard, so you have to follow step by step guide to make the system run. Otherwise these are excellent cursors with perfect size, ideal for gaming and everyday use. If you are searching for an unusual and intrigue looking mouse pointer, with stylish design then you definitely have to try Radium 2. I love this mouse cursor, because it has cool design and the colours are selected preciously to ensure high level of user experience. Radium 2 also comes with INF file, meaning that everyone can install this package on any computer with ease. Nowadays it’s hard to find practical and still nice looking mouse pointer for lefties. Thanks to skilled designers from Czech Republic we have Entis, product which is favoured by 100,000 users. I think that main advantage of Entis is free mirroring tool, because competitors offer same option only with premium package. Beside the mirroring option, you also get free copy of installation wizard for Mac and Linux systems. This little things make Entis one of the best mouse pointers, because in real life even small things matter. Crystal clear is truly translucent mice pointer, which you can find on the internet today. For me one of the major advantages of crystal was minimalistic design and fully animated cursors. New version of crystal clear features adjustable visibility functions and smooth animations. Unfortunately this theme is only compatible with windows platforms, but developers promise that next update will solve this problem. If you want to go feather and invest some money in mouse cursors, there is also a premium version of Crystal Clear with completely different styles and high quality animations. If you are looking for a cool mouse pointer, with elegant design and colourful scheme, then you definitely have to try Gaia 10. 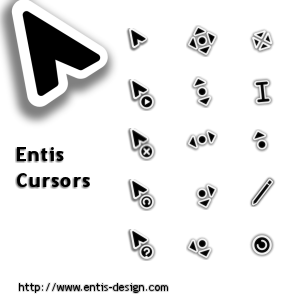 This incredible set of cursors gives you refreshing feeling, for any type of operating system. Included INF file ensures that installation process is simple and clean. Gaia 10 comes with 10 cursors, including 4 animated and 6 static pointers. This theme is perfectly designed for windows, with its bright and crispy colours. I definitely recommend it! I am big fan of aviation and all this time I was looking for nice looking planes, to customize mouse pointer. Finally I found the WWII Aviation Cursors set, that combines 13 animated planes from 40’s, each of which is part of our history. Here you can see B-29 Superfortress, P-51 Mustang and even Mitsubishi G4M3 also known as “Betty”. This set contains almost every famous warbird of world war 2, and still few of them are in flyable condition. 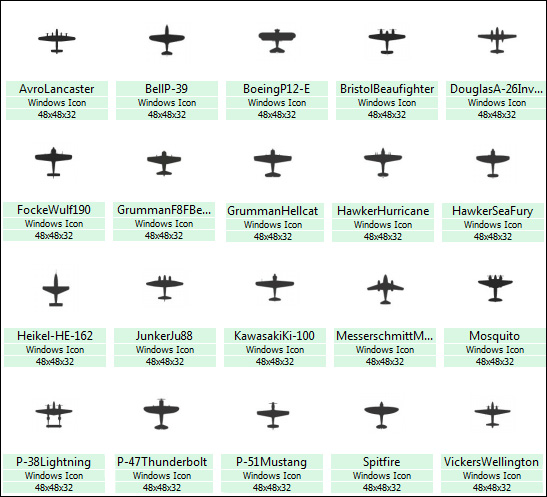 So if you want to be the part of the history, download this incredible set of cursors and see how WWII aviation looked like. 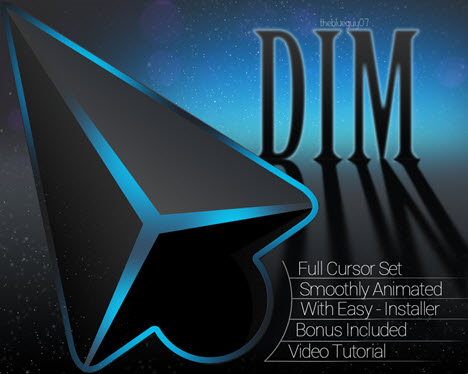 DIM is an attractive mouse cursor, with smooth animations and cool 3D effect inspired by video game. It is the world’s first windows mouse cursors, which gives you mixture of 2D and 3D design. The premium pack includes different set of animations and high quality textures, which is ideal for everyday use. For people who are unfamiliar with installation process, DIM Cursor comes with easy-to-use installer and video tutorial. Third version of this incredible theme includes two bonus cursors, but main advantage of DIM is transparency option which enables users to see through, when you hover the mouse pointer over the text. Overall, Dim Cursor is elegant and crystal clear mouse cursor with awesome 3D effect. This incredible theme is loved by everyone, because of simple design and minimalistic look. Simplify was initially created by “outofashion” and they got inspiration from windows 7 theme (.edu link). 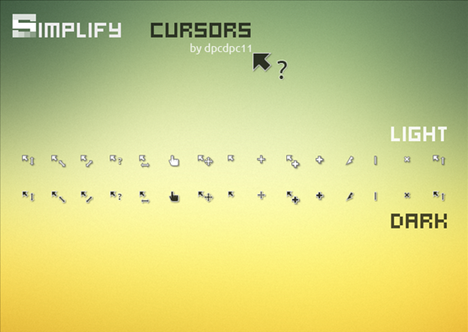 All the cursors are small and easy to understand, that is why this set of cursors match every taste. The theme comes with two different looks; dark and light. In order to make your life easier, developers have included INF file for quick installation process. One thing that I would like to change is the actual size of the cursors, because of its small design sometimes it’s hard to navigate in the browser. Otherwise I love this pointers they look great on my desktop and most importantly they are free cursors, so everyone can download and use it. 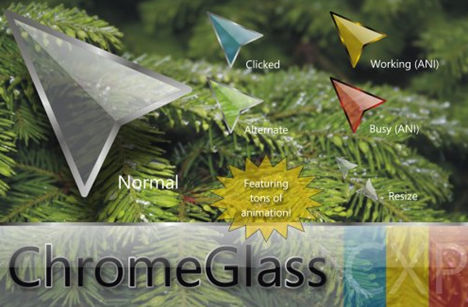 Chrome glass is a simple and smart cursor, with impressive style. Like DIM cursor it has as 3D design mixed with configuration options. There is only one set of pointers, but it can deliver more information than any other device on the market. Main advantage of this pointer is that, it changes colours according to computer status. For example when you click the mouse button the cursor goes blue, when the system is busy pointer turns red. This system allows user to fully control their PC, and combine all necessary tools in one gadget. In order to install the Chrome Glass, you have to run an EXE file as administrator. Personally this mouse cursor is my favourite, because it’s simple and still extremely helpful for everyday use. In most cases after you download the installation package, there should be an INF file that is usually included in every archive file. In order to extract files from an archive, use 7-Zip or WinZip which is open source windows utility for manipulating archives. When you open the folder find .INF file and right-click on it, to select the install. Next you have to open the control panel ->Personalization-> Change your mouse pointers -> pointers and choose your pre-installed scheme in the drop-down menu. After you select your mouse pointer, press OK and enjoy your favourite mouse cursor. 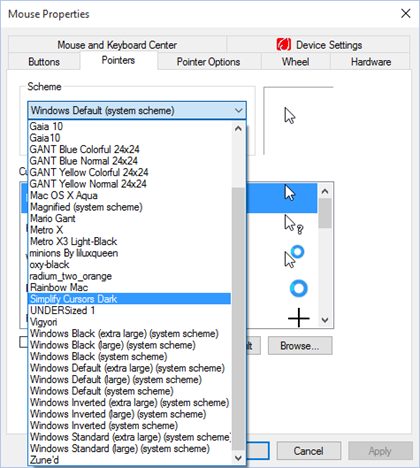 If you there is no .INF file included you have to install it manually, by following some simple step which you can find in this Tutorial: How to customize Mouse Pointer for windows and Mac. It was a really interesting process to create complete list of top mouse cursors. I have tested different schemes and finally came up with this list. Hope you’re gonna love it and don’t forget to comment and share your own ideas. We will carefully review each and every mouse pointer which you will suggest to use and they will definitely complete our list.